When Shindico landed the first urban-format Target in Canada in 2013, it was supposed to be the finest of feathers in the cap for one of Manitoba’s largest and most successful developers. The two-storey, 133,000-square-foot structure constructed on the former Canad Inns Stadium site — the former home of the Winnipeg Blue Bombers — would be a flagship for the development and real estate management company, which started modestly more than 40 years ago in Portage la Prairie, Man. Unlike many other Targets in Canada, which took up residence in former Zeller’s stores, the urban-style target would be built from the ground up. It would have a smaller footprint and include space for other retailers or office space in the midst of a highly developed, dense urban setting. Simply put, it would be trend-setting for a department store development. Then the Minneapolis-based retail giant began its infamous retreat from the Canadian market in 2015, closing 133 stores totalling about 20 million square feet. It left a massive hole in the country’s retail real estate market. What had been a boon for Shindico turned into a multi-million-dollar albatross. The company along with its development partner Cadillac Fairview — which owns the nearby CF Polo Park, the city’s oldest and largest shopping mall — had purchased the land for more than $30 million in 2012 and were left scrambling to find a new tenant. “Every month we were pushing a new Mercedes off the roof,” Shindico president Sandy Shindleman says about the costs involved in maintaining the empty property. Yet earlier this year, Shindico announced it had finally found a new tenant: call services provider 24-7 Intouch, a Manitoba-based firm with international reach. Now called the Plaza at Polo Park, the original building has been subdivided into three. In addition to 24-7 Intouch, off-price retailer TJX has leased out the second space for Winners and HomeSense stores, leaving Shindico to find one more tenant. To put it mildly, he says, the former Target proved challenging even though it had a prime location in the Winnipeg market. 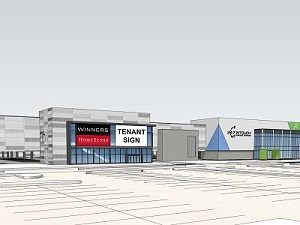 The St. James/CF Polo Park mall area is about 10 minutes’ drive west of downtown and an even shorter ride from Winnipeg’s James Armstrong Richardson International Airport. “Over the years, it’s become our downtown shopping destination,” Shindleman says, adding CF Polo Park is among the better malls in the country. However, finding tenants presented many obstacles because the development’s structure did not easily lend itself to subdivision. For instance, its tar roof had not been built properly, making adding additional modifications difficult. Consequently, Shindico had to think outside the box, even examining whether part of it could be repurposed for multi-residential, building up a red-hot North American trend: live, work and play style developments. In fact, the company has already been working on incorporating that concept into its other developments. “We think that it’s certainly going to be the new standard for a long time,” he says, adding it helps make developments more resilient to challenges like losing an anchor tenant. As examples, Shindleman points to Shindico’s Grant Park Festival, which features several retail chains including grocer Sobeys (EMP-A-T), and its 340,000-square-foot Shops of Kildonan Mile in the eastern part of the city. Both are in the heart of major retail areas with nearby residential developments. Yet while Shindico is not new to multi-residential management, its wheelhouse has been retail development. That said, Shindleman says the company’s management recognizes the marketplace is moving toward increasingly dense, walkable developments. Consequently, it has sought to gain more experience in multi-faceted development that includes residential. Among its efforts has been investing as a non-managing partner in multi-use developments in Toronto which include multi-residential. Moreover, the company has plenty of runway to build upon the trend in Manitoba and in North America. Its current development and management portfolio is worth hundreds of millions, but it also has more than $1 billion of undeveloped property in prime locations in Manitoba and elsewhere. Increasingly, Shindico’s management recognizes the importance of fostering diversity in developments, when appropriate, because it helps to ensure retail tenants have built-in or nearby day- and night-time populations that will use their services. The Target debacle only highlights this need, Shindleman says, because having office and residential adjacent to or within a development makes it more attractive should the need arise to find a large anchor tenant. Still, he says Shindico was built on good fundamentals, which serves it well when plans go awry. Location and trends aside, “you still need good people on the ground every day, so when something is thrown in your basket, you can immediately mitigate the situation,” Shindleman says.